I first heard about The Family from One End Street: and Some of Their Adventures by Eve Garnett from the BBC television special, "Picture Book: An Illustrated History of Children's Literature", which my husband and I watched together a few years ago. In a segment of the show, Jacqueline Wilson, author of The Story of Tracy Beaker, spoke of the way Garnett's portrayal of working class life resonated with her as she grew up in similar circumstances. She identified the book as the first children's novel to show what it was truly like to be from a poor family. We have hunted high and low for this book for years, and it was only a shot-in-the-dark search at OpenLibrary.org that finally led to me finding and reading it. It was an added bonus that the book won the 1938 Carnegie Medal, making it possible for this to be the first book I will review for the Old School Kidlit Reading Challenge. The Ruggles family is at the center of this book. Mr. and Mrs. Ruggles are a dustman and a washerwoman, and they have seven children: Lily Rose, Kate, Jim, John, Jo Jr., Peg, and William. In each chapter, a member of the family has a problem or adventure which the reader experiences through that character's point of view. These include Lily Rose's accidental destruction of an article of clothing belonging to one of her mother's laundry customers, Kate performing well enough to be admitted to a school for which the cost of uniforms might be far outside the family budget, and William being entered in a baby show, which he would have a better chance of winning if only he would cut a tooth. Though the family is poor, there is very little in these episodes that would elicit pity from a child reader. Rather, the Ruggles have just as much fun - and get into just as much trouble - as any Melendy, Pye, Moffat or other literary heroine found in the children's books of the 1930s and 1940s. Garnett has a wonderful ear for dialogue and a true understanding of the way kids' minds work. 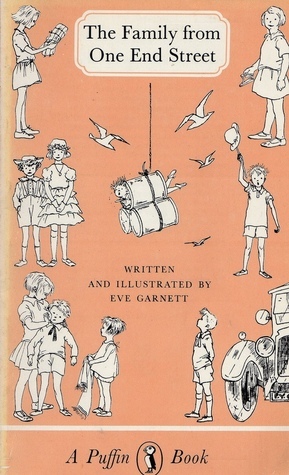 Though many of the concerns the Ruggles kids struggle with are not relevant to the worries of contemporary kids, their feelings of embarrassment when they do something wrong and their spirit of adventure when a new opportunity arises can be understood by children from any time period, and readers of any age. This book was really a treat, and well worth the long while I had to wait to get my hands on a copy. Strangely, I actually think it will be easier for me to get a hold of the sequels, Further Adventures of the Family from One End Street and Holiday at the Dew Drop Inn, which I hope to read soon. I read this quite a number of years ago and remember enjoying it. Interestingly, it was also through Jacqueline Wilson that I found out about it - she mentioned it as one of her favourite books in her book about her childhood.